The academy's 870 square foot classroom has enough seating for 30 students and utilizes big screen projection, power point pr esentations and DVD videos to enhance in-class instruction. The classroom also provides electrical and mechanical hands-on experience as well as technical material covering electrical, mechanical, air distribution and installation instruction. The Academy also has an impressive 1,370 square foot training lab unlike any other training facility in the HVAC industry. 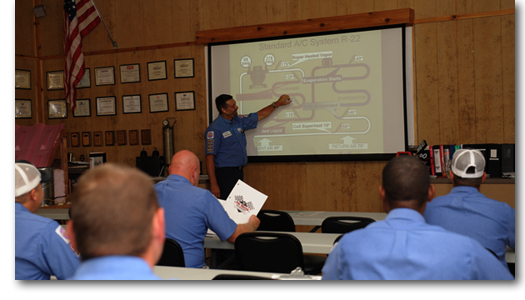 The lab offers hands on training for all levels of HVAC expertise. Major areas of learning include Air Conditioning, Gas Heating, Heat Pump, Air Side and Zoning and Manufactured Home. Real working examples for each major area are available to the student which provides for different approaches of training. The lab also allows the student to learn soldering, carpentry, duct and plenum fabrication, thermostat wiring, programming and electrical wiring.